Ashmount students have been creating their own poetry as part of an exciting new project with Attenborough Arts. A group of 28 students who use communication aids, AAC devices or Eye-Gaze technology to facilitate their communication have been working alongside poet John Berkavitch, learning to recognise poetry as simply ‘our best words in their best order.’ The focus of the project has been to provide young people with opportunities to use words outside of their existing vocabulary and rearrange them into their own poetic responses. Funding from Maxliteracy and the Reinhardt Foundation enabled us to launch the project which seeks to develop resources for non-verbal communicators and those with very limited spoken language to make creative, poetic responses to a variety of new and exciting experiences. Students used their devices to perform poetry within school and have seen their work displayed in the nationally-acclaimed Attenborough Arts Centre. During the course of the project pupils have been fully involved in designing, testing and evaluating the resources we have produced. We have already released a fully adaptable low-tech E-Tran frame which will be made freely available to all galleries and cultural venues to enable complex communicators to make their own responses to the exhibitions and performances they see. 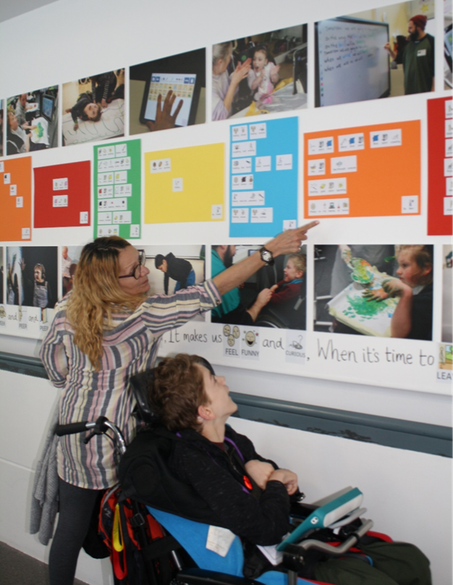 Ashmount has also worked with Smartbox to develop a poetry map for eye-gaze users and a multi-level communication platform which will enable eye-gaze users to communicate creatively.